From the Roman Breviary of 1529, the beginning of the sermon for the feast of All Saints. We read in the histories of the Church that Saint Boniface, who was the fourth bishop of Rome after the blessed Gregory, by his entreaties obtained from the Caesar Phocas that the temple of Rome which was called the Pantheon by the ancients should be given to the Church of Christ, since it seemed to be be as it were the image of all of the gods. In this temple, having cleaned away all the filth, he made a church in honor of the holy Mother of God and of all the holy Martyrs of Christ, so that, the multitude of demons being shut out, the multitude of Saints might be held in memory there by the faithful, and the whole people on the first of November might come together to the church consecrated in honor of all the Saints…therefore, from this custom of the Roman church, as the Christian religion grew, it was decreed that in the church of God built through the length and breadth of the world, the honor and memory of the Saints should be kept in the day we have mentioned, so that whatever human frailty by ignorance or negligence or occupation with the affairs of this world did less fully on the solemnities of the Saints, might be completed by this holy observance, and so that, protected by their patronage, we may be able to come to the joys of Heaven. 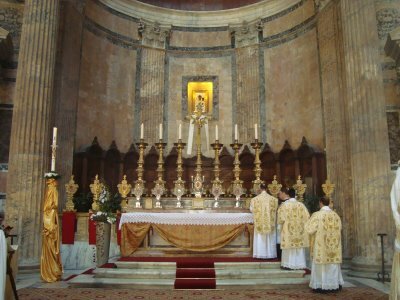 Mass celebrated in the Pantheon on May 13, 2009, the fourteenth centenary of the building's dedication as a Christian church. Photo courtesy of John Sonnen. In the Middle Ages, the sermon read at Matins on the feast of All Saints was the same in almost every Use of the Roman Rite, called from its first words “Legimus in ecclesiasticis historiis”; the real author is unknown, although it was frequently attributed to St Rabanus Maurus. The first lesson refers to the institution of the feast of All Saints, and the dedication of the Pantheon as a church. The second lesson is about God, while the six lessons that follow descend through the hierarchy of the Saints: the Virgin Mary, the Angels, the Patriarchs and Prophets, the Apostles, the Martyrs, and the various types of Confessors. The holy Virgins and other female Saints are mentioned in the same lesson as the Virgin Mary, the model of consecrated life; the ninth lesson is taken from a homily of St. Augustine on the Sermon on the Mount, the beginning of which is the Gospel of the feast. For the eighth year in a row, we will celebrate the feast of All Saints and its octave by going through one of these beautiful sermons day by day.